Reproductive cloning, possible through artificially-induced asexual reproduction, is a method used to make a clone of an entire organism. A form of asexual reproduction, parthenogenesis, occurs when an embryo grows and develops without the fertilization of the egg. In reproductive cloning, if the haploid nucleus of an egg cell is replaced with a diploid nucleus from the cell of an individual of the same species, it will become a zygote that is genetically identical to the donor. Reproductive cloning has become successful, but still has limitations as cloned individuals often exhibit facial, limb, and cardiac abnormalities. Therapeutic cloning, the cloning of human embryos as a source of embryonic stem cells, has been attempted in order to produce cells that can be used to treat detrimental diseases or defects. Reproductive cloning is a method used to make a clone or an identical copy of an entire multicellular organism. Most multicellular organisms undergo reproduction by sexual means, which involves genetic hybridization of two individuals (parents), making it impossible to generate an identical copy or clone of either parent. Recent advances in biotechnology have made it possible to artificially induce asexual reproduction of mammals in the laboratory. Reproductive Cloning of Dolly, the Sheep: Dolly the sheep was the first mammal to be cloned. To create Dolly, the nucleus was removed from a donor egg cell. 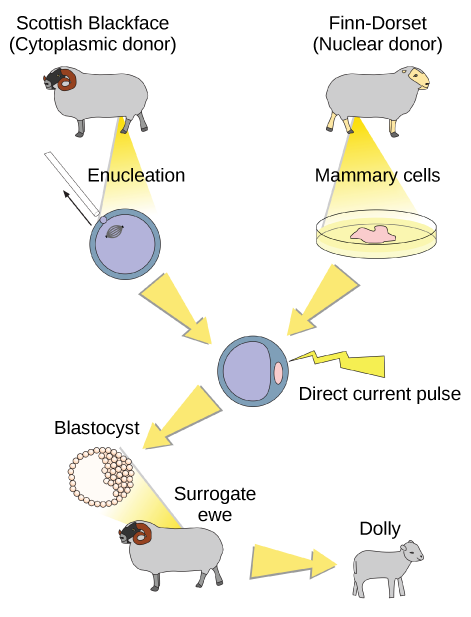 The nucleus from a second sheep was then introduced into the cell, which was allowed to divide to the blastocyst stage before being implanted in a surrogate mother. Parthenogenesis, or “virgin birth,” occurs when an embryo grows and develops without the fertilization of the egg occurring; this is a form of asexual reproduction. An example of parthenogenesis occurs in species in which the female lays an egg. If the egg is fertilized, it is a diploid egg and the individual develops into a female; if the egg is not fertilized, it remains a haploid egg and develops into a male. The unfertilized egg is called a parthenogenic, or virgin, egg. Some insects and reptiles lay parthenogenic eggs that can develop into adults. Sexual reproduction requires two cells; when the haploid egg and sperm cells fuse, a diploid zygote results. The zygote nucleus contains the genetic information to produce a new individual. However, early embryonic development requires the cytoplasmic material contained in the egg cell. This idea forms the basis for reproductive cloning. If the haploid nucleus of an egg cell is replaced with a diploid nucleus from the cell of any individual of the same species (called a donor), it will become a zygote that is genetically identical to the donor. Somatic cell nuclear transfer is the technique of transferring a diploid nucleus into an enucleated egg. It can be used for either therapeutic cloning or reproductive cloning. The first cloned animal was Dolly, a sheep who was born in 1996. The success rate of reproductive cloning at the time was very low. Dolly lived for seven years and died of respiratory complications. There is speculation that because the cell DNA belongs to an older individual, the age of the DNA may affect the life expectancy of a cloned individual. Since Dolly, several animals (e.g. horses, bulls, and goats) have been successfully cloned, although these individuals often exhibit facial, limb, and cardiac abnormalities. There have been attempts at producing cloned human embryos as sources of embryonic stem cells. Sometimes referred to as cloning for therapeutic purposes, the technique produces stem cells that attempt to remedy detrimental diseases or defects (unlike reproductive cloning, which aims to reproduce an organism). Still, therapeutic cloning efforts have met with resistance because of bioethical considerations.